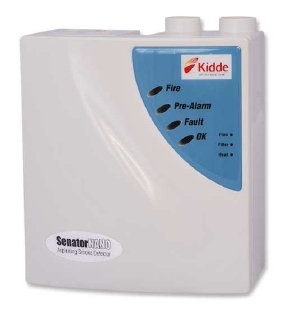 The Senator Nano has been designed to provide low cost entry level aspirating smoke detection while maintaining many of the features of the Senator product range. Classifire-3D® Perceptive Artificial Intelligence ensures that the detector operates at optimum sensitivity for the protected environment, without the need for complex setup. This means the product will configure itself to provide high sensitivity in a small comms room or reduced sensitivity in a smoky area. The detector is supplied in an easy to install robust polycarbonate enclosure. Simple on site programming is provided through an internal DIL switch requiring no special programmer or PC. Secondary LED indications are provided on the unit to assist with diagnostics. An optional communications card allows the Senator Nano to be included as part of a Senator network with remote communications using the SenseNET software package. Interfacing with other equipment can easily be achieved through the Integral Pre-Alarm, Fire and Fault relays. Senator Nano is also fully compatible with the Addressable Protocol Interface cards (APIC) allowing it to interface to addressable fire alarm panels using several available protocols.